Easy Grammar Plus - Easy Grammar Plus is the non-grade level edition of Easy Grammar. This text is not explicitly published as a "7th grade" curriculum, but 7th grade is one of the ideal (and most common) years to use it. For students below grade 7, check out Easy Grammar texts specifically for Grades 2, 3, 4, 5, 6. The Plus edition is designed to give any student above 6th grade a solid foundational understanding of grammar. There are many reasons why this text is so popular. First, Easy Grammar uses a prepositional approach that strips sentences down to their core. This helps students learn and identify the most essential parts-of-speech. Students learn to identify subjects, verbs, and prepositions before moving more challenging topics. After a solid understanding of grammar, students will cover subject-verb agreement, predicate nominatives, difficult capitalization and punctuation rules, gerunds, and the perfect and progressive tenses. When they call it "easy," they mean it. The text was written at a fourth-grade reading level to ensure comprehension. Additionally, this text (just like all Easy Grammar books) teaches concepts through sequential grammar units. This is literally grammar made easy! 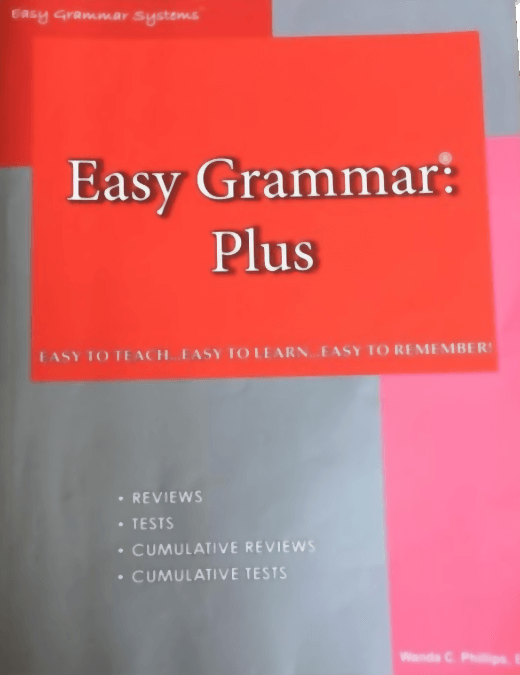 There is a Student Test Booklet for the Easy Grammar Plus edition. This is usually ordered in addition to the textbook. Why? Although the teachers edition is an "all-in-one book," it is almost always easier and less time consuming (sometimes even more affordable) to buy the student workbook. Either bundle, or burn through some printer ink & paper! We have found that this is one of the most easily understandable and student-friendly grammar workbooks available. The student instructions in this text (as well as the exercises) are all concise (as usual) and "make sense." WAIT - We are starting with prepositions? Yes, and don't worry! Easy Grammar teaches prepositions and prepositional phrases in the beginning so that sentences are easily simplified by their removal. This is a unique and more unusual way to teach students to parse a sentence, but it eliminates so much complexity. Easy Grammar Plus or Daily Grams? Easy Grammar Plus is perfect for teaching grammar and review. The Daily Grams are just for review and much shorter in length. Day Grams are not a full curriculum, but Easy Grammar Plus will be. Easy Grammar Plus is perfect for regular unit repetition to keep grammar sharp. This is an option/additional booklet. If you are a homeschool parent with multiple children this test booklet will save you from making copies of the tests. The student test booklet is available for puchase here. We just finished Easy Grammar with our 7th grader (using the Plus edition) and really liked it. The constant repetition was just what she needed and it was the first time that she has ever had a clear understanding of grammar. We are going to use it again for 8th. WE LOVE IT! It's different from other programs in the you learn the prepositions and prepositional phrases first crossing them out -- then you move on. We use Easy Grammar in place of SL's LA. BEST investment I've ever made. We really like Easy Grammar. It does teach the rules and is very thorough and only takes about 15 minutes a day. We are planning on use it all the way through high school. I haven't used it with my kids because they're too young yet but my mom used Easy Grammar with my brothers and I. It's been 16 years since I graduated and I still remember the lessons from Easy Grammar! It definitely stuck with me! Take a peek inside the book's pages!